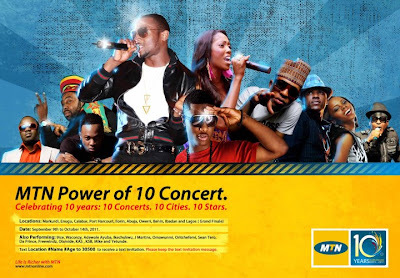 MTN Power of 10 Concert – Celebrating 10 years: 10 Concerts. 10 Cities. 10 Stars. Oritshefemi, Sean Tero, Da Prince, Freewindz, Olamide, KAS, KSB, Mike, D’banj, Tiwa Savage, Whizkid, DJ Zeez, Iyanya, Omawunmi, Mike, Naeto C, Freewindz, Olamide, Sound Sultan.. and Yetunde. Text Location #Name #Age to 30500 to receive a text invitation.